The Solar Decathlon 2017 competition houses, modeled in Aurora. The top three house designs from the 2017 U.S. Solar Decathlon, from left to right: the NeighborHub House by the Swiss Team, the reACT House by Team Maryland, and the RISE House by UC Berkeley and the University of Denver. Photo credits: (left) Dennis Schroeder/U.S. Department of Energy Solar Decathlon; (center and right) Jack Dempsey/U.S. Department of Energy Solar Decathlon. Both the Swiss Team and UC Berkeley/University of Denver did exceptionally well in the measured competitions, losing just a few points across the Health & Comfort, Appliances, Home Life, and Energy contests. In the juried contests, the Swiss Team took second place and Maryland tied for 3rd (with the Northwestern house). The Energy Contest evaluates each team’s energy production (kWh) and the value ($) of that energy based on a theoretical utility rate structure. Of the total 100 points for the Energy Contest, energy production accounts for 60 possible points and energy value accounts for 40. Each team’s house both could both contribute energy to and take energy from the Solar Decathlon electricity grid (a microgrid created for the competition), just as would be the case for net metered customers on the U.S. electricity grid. Additionally, for the first time, this contest included time of use energy pricing. Graph of teams’ cumulative energy production and energy value, the two components of the Energy Contest. Credit: U.S. Department of Energy Solar Decathlon 2017. 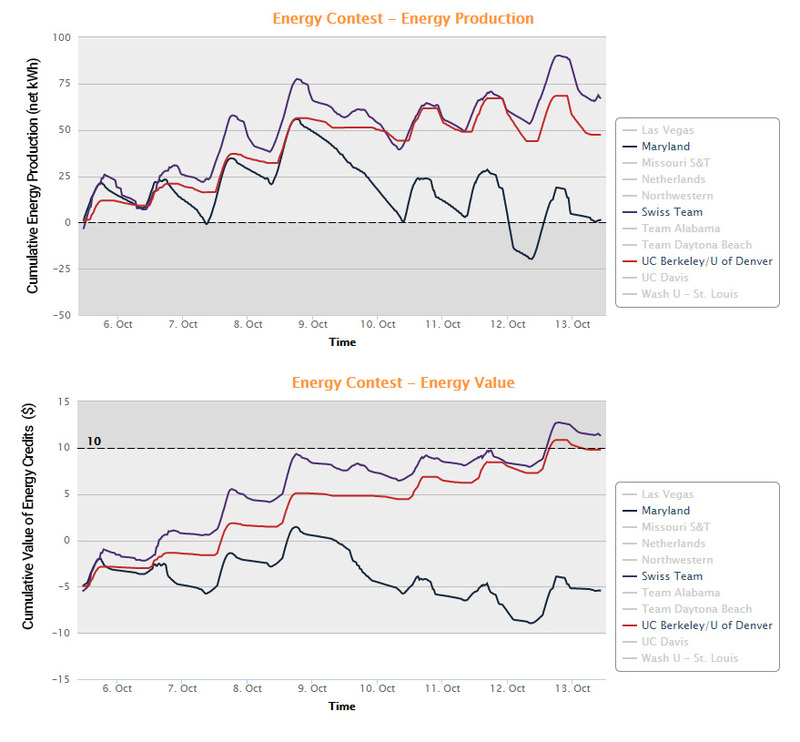 The above graphs show the top three teams’ energy production and energy value throughout the competition week. In the energy production segment, teams receive the full 60 points if they have an energy surplus for the competition; if they have an energy deficit, they can receive partial points depending on the size of the deficit, between 0 and -50 kWh. For the energy value segment, teams get the full 40 points for having at least $10 in energy credits by the end of the competition, with prorated points for having between $10 in credits and -$10 in energy charges. Both the Swiss Team and UC Berkeley/University of Denver achieved the $10 credit threshold, and Maryland managed their house energy demands at the end of the contest to keep a small energy surplus despite inclement weather that reduced energy production. 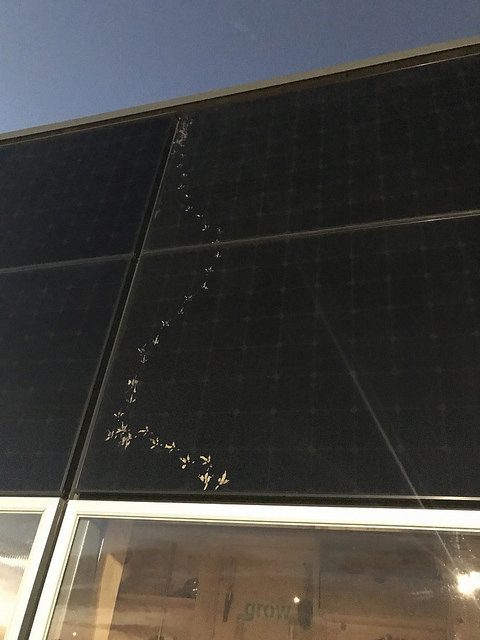 October 9th was the first time in all of the Solar Decathlon contests that snow fell on the competition site, presenting a new challenge for the competitors. Most of the Solar Decathlon teams had PV systems sized to handle inclement weather, as is evident in the growing energy surplus for all three teams during the in the first few (sunny) days of the competition. This surplus proved very valuable when snow arrived midweek. During the snowfall, we can see that each of the houses experienced a decline in their net energy balance, a result of powering their homes for the contests while there was minimal production from the PV arrays. While several teams had to sweep snow off their solar panels to keep the systems up and running, the Swiss Team simply left the facade of the NeighborHub closed. This prevented snow from accumulating in the first place, contributing to their strong performance. Not all systems were designed with snow in mind, but rather reflected the climate of the house’s target market. A model of NeighborHub in Aurora, showing the house’s ability to adjust pitch of its panels. Photo credit: Joe Simon/U.S. Department of Energy Solar Decathlon. You can also check out some of the innovations that have come out of the Solar Decathlon competition in their latest blog post.What solar design lessons did you take away from the U.S. Solar Decathlon 2017? Let us know in the comments! 1. Architecture: A jury of architects evaluates each team’s architectural concept and design approach; the implementation of the design and its innovative features; and required documentation for the project. 2. Market Potential: Teams design a primary residence for year-round occupancy for a specific target client. A jury of professionals from the homebuilding industry evaluates the overall attractiveness of each team’s design to its selected target client and the market impact potential of the house. 3. Engineering: A jury of engineers evaluates the engineering design and implementation of each team’s house based on the engineering approach, design, efficiency, and performance. 4. Communications: A jury of communications professionals evaluates each team’s communication strategies, materials, and efforts to educate, inform, and interest the team’s local communities, visiting public at the event, and diverse online audiences. 5. Innovation: This is a new contest for Solar Decathlon 2017. A jury of industry professionals will evaluate each team’s research, approach to sustainability, innovations for the target client, and durability and safety of innovative elements, while also evaluating whether the price is right for the target client. 6. Water: Solar Decathlon 2017 is rewarding smart water solutions for the first time. A jury of industry professionals evaluates each team’s approach to water conservation, water use and reclamation, and landscaping water impacts. 7. Health and Comfort: Team houses must minimize the flow of cooled air in summer or heated air in winter to the outdoors, operate heating and cooling systems that keep temperature and humidity steady, all while maintaining healthy indoor air quality. 8. Appliances: The Appliances Contest is designed to mimic the appliance use of an average U.S. home. Teams earn points for operating their refrigerator and freezer, washing and drying laundry, and simulating cooking tasks and hot showers. 9. Home Life: Teams are required to engage in common household activities that use electricity. They cook and share meals with friends and neighbors, watch television, use computers, and host game nights. And, for five days, they “commute” at least 25 miles in an electric vehicle charged by the house solar electric system. 10. Energy: The Energy Contest evaluates each team’s energy production and a theoretical value to a utility of the energy each team both contributes to and takes from the Solar Decathlon electricity grid. For the first time, this contest includes real-time energy pricing. This entry was posted on Thursday, October 26th, 2017 at 2:32 pm and is filed under Appliances, Architecture, Awards, Communications, Competition, Contests, Energy Balance, Engineering, Home Life, Market Appeal, Maryland, Solar Decathlon, Swiss Team.